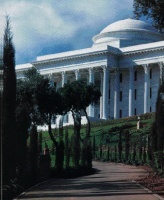 In brief it is sufficient to know that there is a Bahá'í Administration which Bahá'ís must obey. 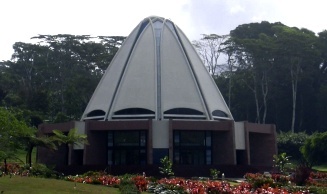 The Universal House of Justice is the supreme governing body of the Bahá'í Faith to which all Bahá'ís may turn. Its nine members are elected by National Spiritual Assemblies from all over the world. The Universal House of Justice consults on all issues and guides the entire Bahá'í world within the light and framework of the teachings of Bahá'u'lláh. To continue the work of the Hands of the Cause the Universal House of Justice appointed an International Teaching Centre. The National Spiritual Assembly in each country is elected every year by delegates at a National Convention. 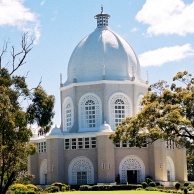 The nine members consult and decide about the affairs of the Faith in that country. Every city, town and village which has enough adult believers elects a Local Spiritual Assembly to consult on the affairs of the Faith within their community. All Bahá'í Assemblies work within the same framework based on Bahá'u'lláh's teachings and their decisions should be obeyed by Bahá'ís. 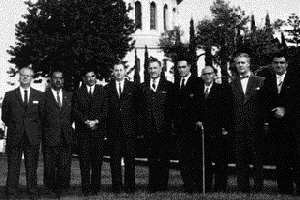 In Bahá'í consultation all parties are considered equal. Individuals are also appointed at various levels to aid in the spread of the Faith and to protect the spiritual health of the Bahá'ís. They are called Counsellors, Auxiliary Board Members or Assistants to the Auxiliary Board and work closely with the Local and National Spiritual Assemblies.